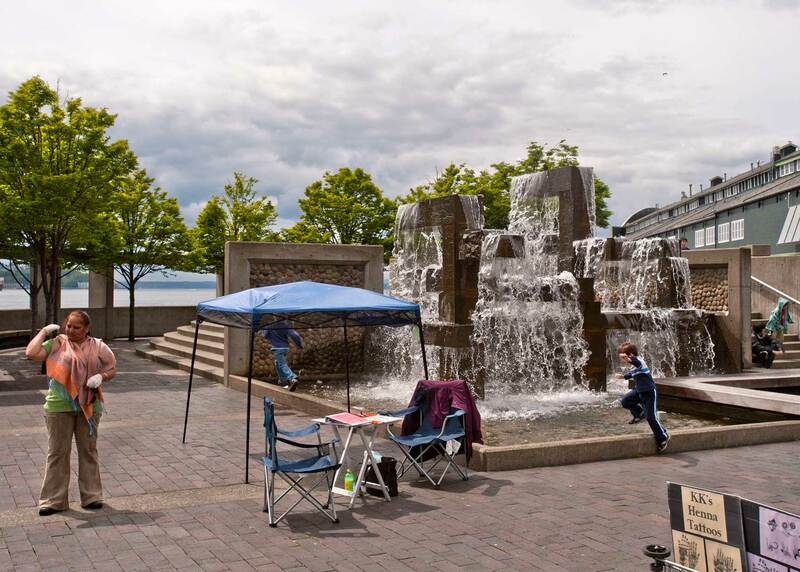 NOW: For the “now” Jean Sherrard includes sculptor James Fitzgerald’s fountain at Waterfront Park, which he visited earlier this year for a repeat of a photograph taken during its construction and printed in Pacific last Feb. 20. 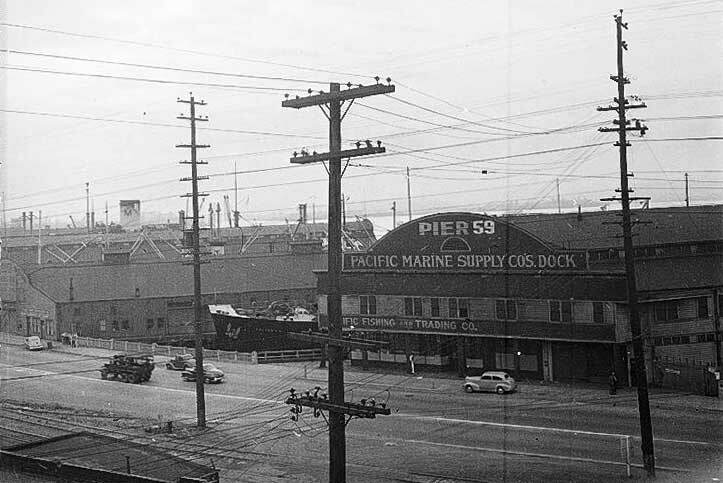 The Pike Street Dock (or pier or wharf), here on the right, welcomed Pacific Net and Twine as its primary renter in 1916, and so began the pier’s preoccupation with fisherman and their needs. The wharf in its enduring landmark size was built in 1903-4. 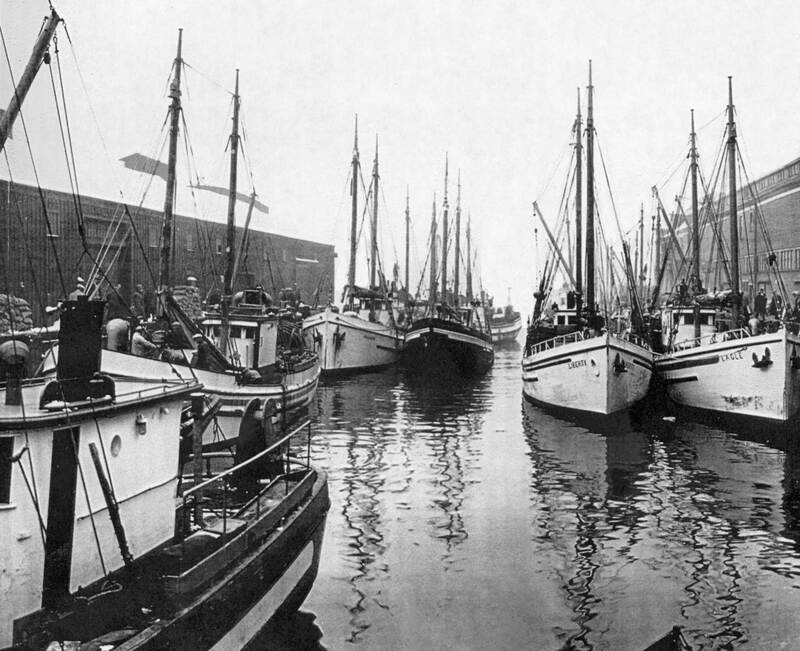 The new dock’s principal tenants then were diverse and included, fish merchants, grain dealers and shipping companies. 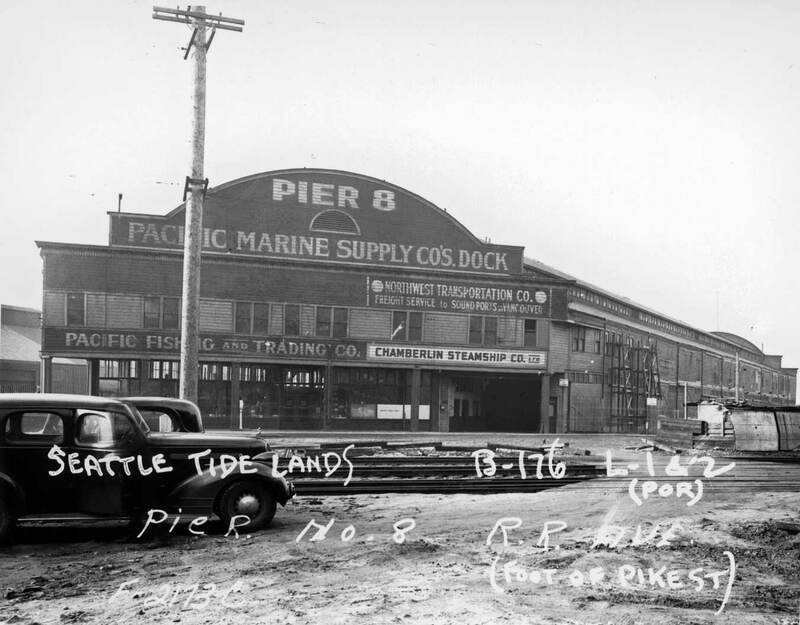 With Pacific Net and Twine in residence, the dock became the central waterfront headquarters for the fishing fleet which often – as here – packed the slip between itself and the Schwabacher Pier, to the south and here on the left. Many of the fishermen’s voluntary groups like the Fishing Vessel Owners Association and the Purse Seiners’ Association took residence on the Pike Dock and a variety of sail-makers, fish brokers, and other specialists in supplies for the fisheries had offices there as well. 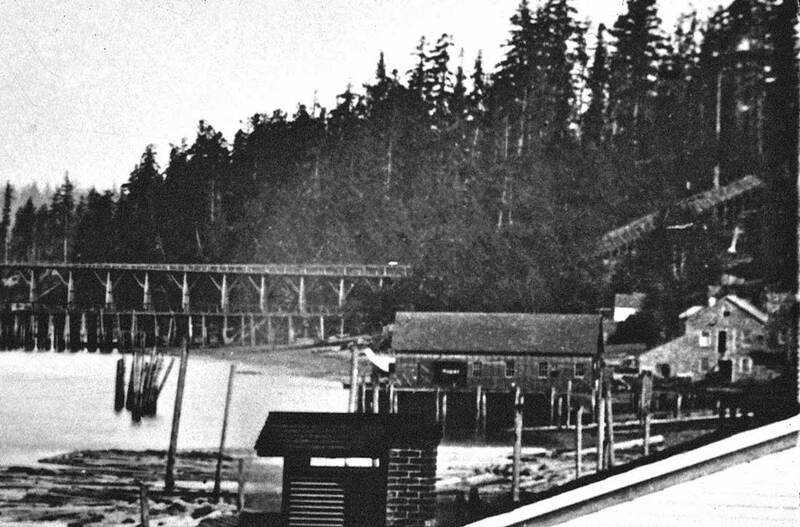 The Schwabacher wharf was the older pier. 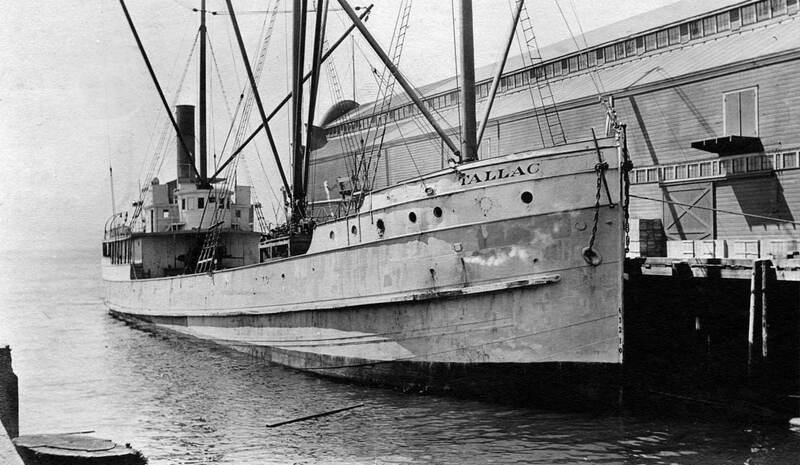 It was in this slip that the gold ship the S.S.Portland made its historic call in July 1897 with a “ton of gold” and thereby launched the gold rush north to the Yukon and Alaska. An older and smaller version of the Schwabacher pier just escaped the city’s “great fire” of 1889, and for weeks following it most of the materials for rebuilding the business district entered the city across its then mostly uncovered deck. Recent history of this slip begins, we will say, with the destruction of what remained of the old Schwabacher Dock in 1967. 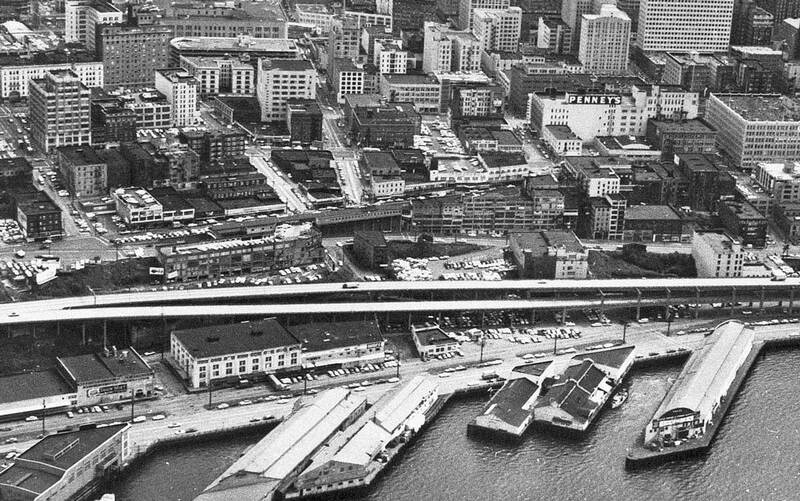 The city purchased – without condemnation – the Pike Pier in 1973 for a bargain of $585,000. Two years earlier Mayor Wes Uhlman switched his advocacy for building a Forward Thrust (1968) funded Aquarium in Ballard to the Pike Street Pier. 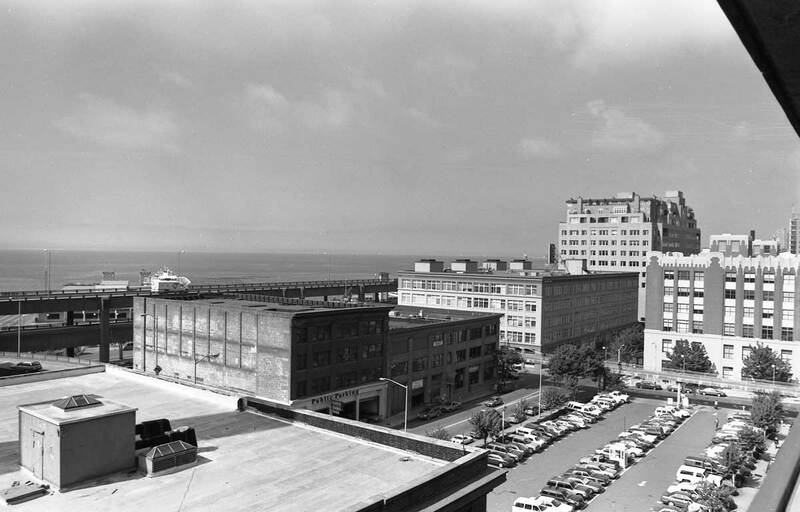 Construction on Waterfront Park (seen, in part, in the “now”) began in the fall of 1973. By the late 1970s both the park’s promenades and the aquarium’s tanks served a, by then, mostly playful central waterfront. Yes Jean there are a few items clinging to the sides of the Pike Pier we will put up. Much else has by now appeared in other stories – or their extras – so I’ll lean on Ron Edge to put them up next as hot-links (do you call them?). After that I’ll do some sampling. 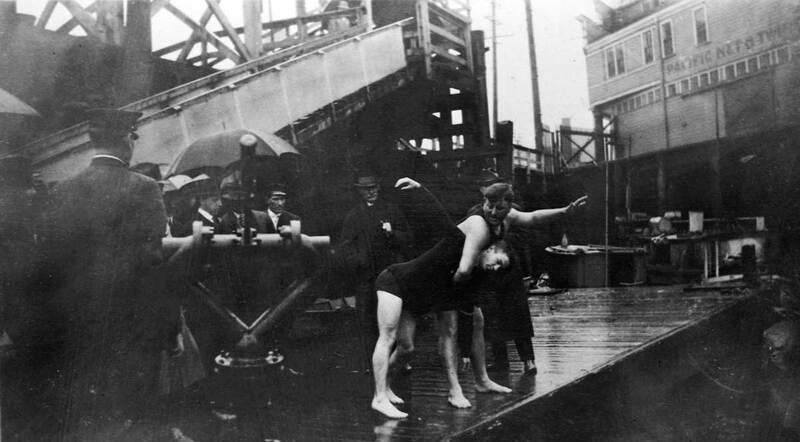 Much of what follows and more can be found in the Illustrated Waterfront History included in the “books” part of this blog. Ron has found three primary links, and each features a string of stories and illustrations. Click on the picture (three of them) directly below and you will be carried to them. 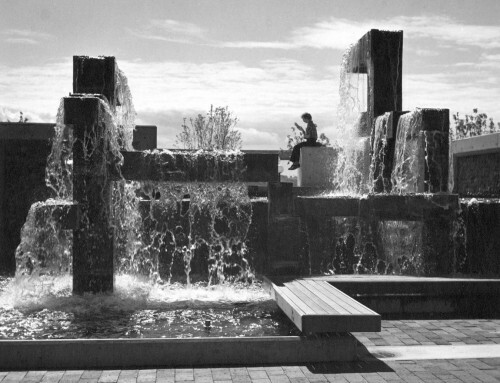 But one of many recordings photographer Frank Shaw made on the waterfront while he was regularly visiting it in the 1970s and '80s. I admit to being mistaken about his subject. Until recently I though the reader was sitting directly on Fitzgerald's fountain. 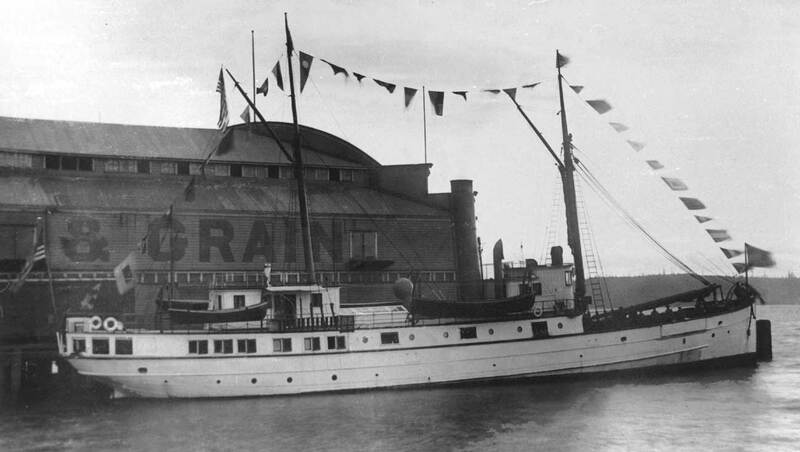 Ninety-nine feet long and propeller-driven the Dode's packet took it to Hood Canal on a day-long run as far as Hoodsport, beginning its return to Pier 3 (now Pier 54) the next morning. Here the Dode rests a the south side of the Pike Street Pier. 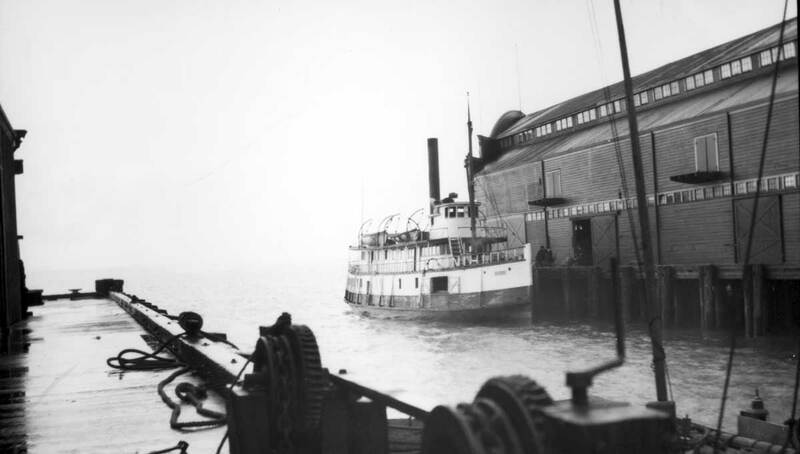 A steamer with no apparent name rests along the north side of the Pike Pier. Like the Dode above it, this view dates from ca. 1912. 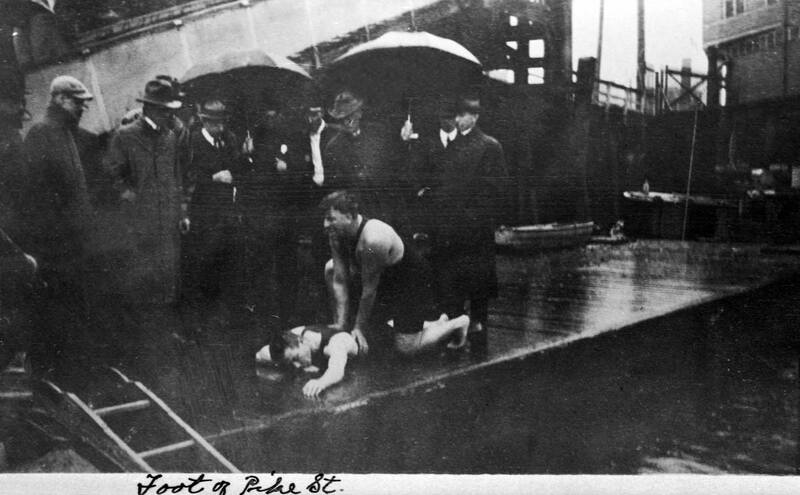 Next we’ll lay in three photographs taken of, to me, an inscrutable life-saving demonstration on a low platform in the slip north of the Pike Pier. These look innocent enough and harmless too, and may most likely be tried at home without injury. 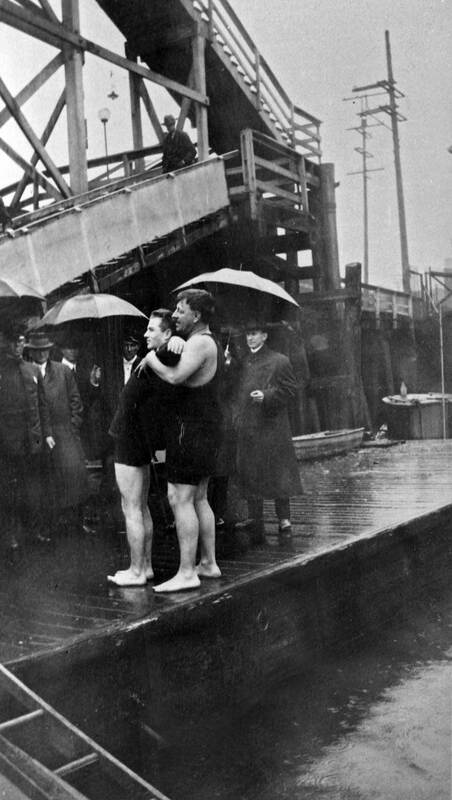 The most heroic part in this is the performers willingness to appear in swim wear on the central waterfront when all others are bundled against the cold – or at least the rain. 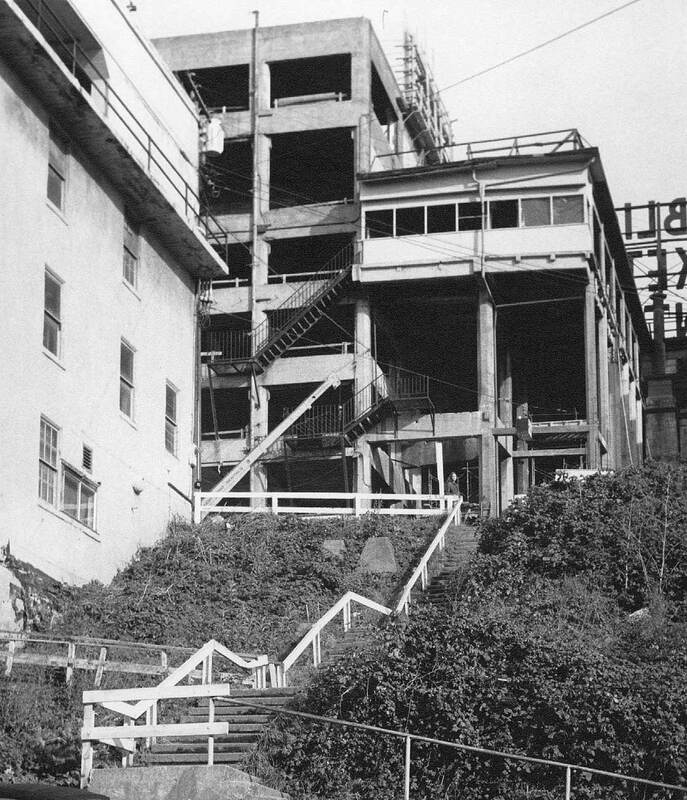 Note the stairway to the Pike Street trestle that after 1912 crossed high above both Railroad Avenue (Alaskan Way) and Western Ave and reached the Pike Place Public Market. The above detail from a 1911 map of the waterfront shows both the Schwabacher and Pike Street piers, and also to the proposed site for a power boat dock, which was never built. There is as yet no 1912 Pike Street trestle spanning Railroad Avenue (Alaskan Way) here. The Bogue Plan map (1912) above includes the then new Pike Street trestle as well as two novelties that were never built. The proposed line for the Union Pacific Tunnel meant, like the 1905 Great Northern Tunnel nearby, to move trains under the city between the new Union Pacific Depot on Jackson Street and the waterfront below Belltown. 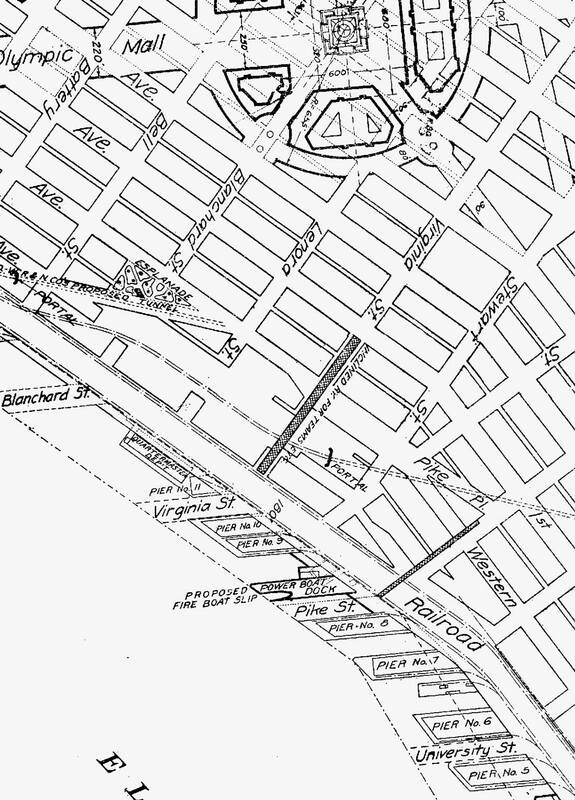 The map also shows an incline on Virginia Street that would have moved teams and their wagons up the steep hill from the waterfront to First Avenue. Another ca. 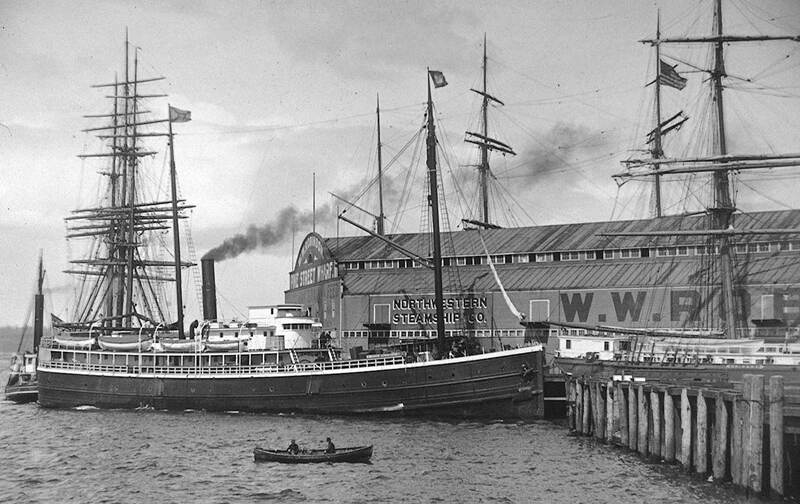 1912 look at the south side of the Pike Pier with another vessel - this one sturdy enough to steam the Pacific - the Tallac beside it. First a detail and the below it a “now-then” of the Pike Street Coal Wharf, which was the first of many docks built at the foot of Pike Street. The photograph dates from the 1870s and was taken from the back porch or window of the Peterson & Bros photography studio on Front Street (First Avenue) at the foot of Cherry Street. The contemporary scene (from ca. 1990) was recorded from the parking garage that extends a block south on the west side of First from Columbia. The “now” prospect is much higher than Peterson’s, whose view was not obstructed my structures on Post Alley. 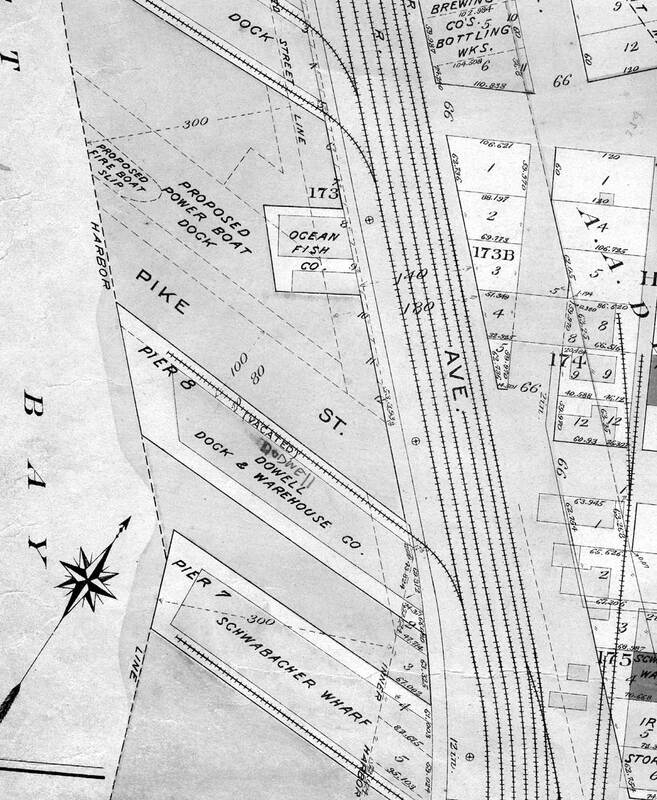 This detail "pulled" from the Peterson & Bros view, directly below, shows both the east end of the Pike Coal Wharf and the incline, on the right, which climbs the bluff to Front Street (First Ave.) with the narrow-gauged rr-track that ran on Pike and the future Westlake to the south end of Lake Union, where the little engine-that-could, named the Ant, moved the coal-filled cars from barges to the tracks and this last leg of the complicated run that began in the coal fields on the east side of Lake Washington. This system continued until 1878 when the new coal railroad, The Seattle and Walla Walla, reached Coal Creek, Newcastle and Renton directly around the south end of Lake Washington from the new coal wharf and bunkers at the waterfront foot of King Street. 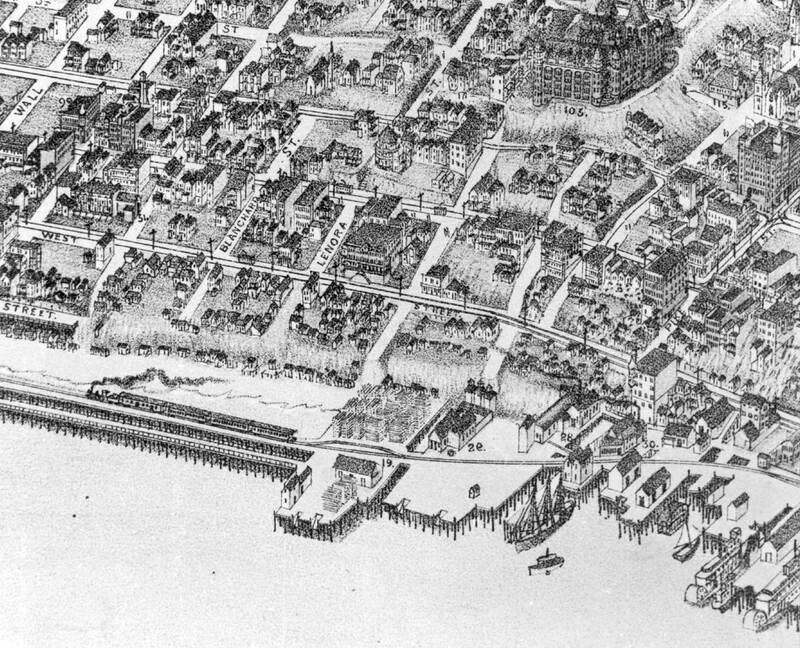 Detail from the 1891 Birdseye of Seattle shows the waterfront north of Union Street with Denny Hill above it, including the Denny Hotel, upper-right. Splotchy but revealing, this scene looks north along the waterfront from the King Street Coal Wharf, ca. 1902 or 3. The dock at Pike Street is a small one with a stepping waterside facade, seemingly third from the right. Actually four from the right because the odd-angled Schwabacher Dock is in there too just to the right of the Pike Pier. 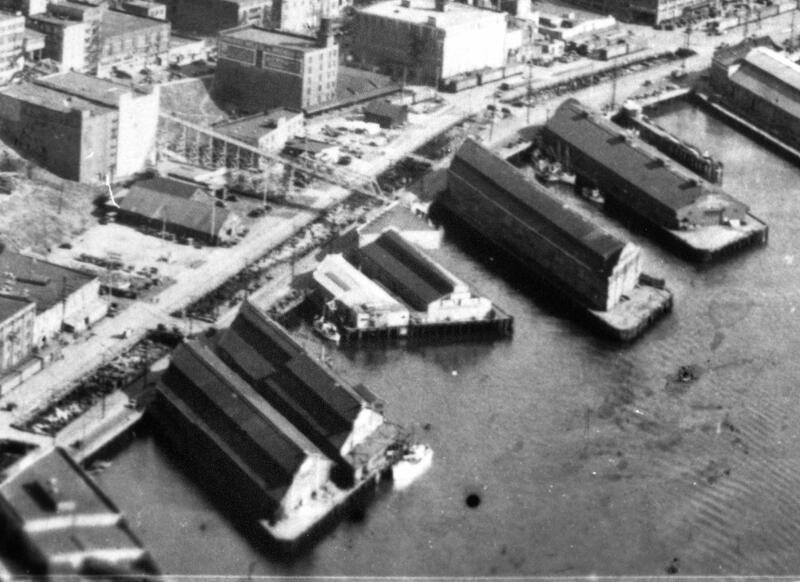 The long white-sided pier center-left is the Gaffney Dock near the foot of Virginia Street. Beyond it is the Coast Company's longitudinal dock, which paralleled Railroad Avenue because Elliott Bay was deeper there and building a finger pier directly into the bay prohibitive. 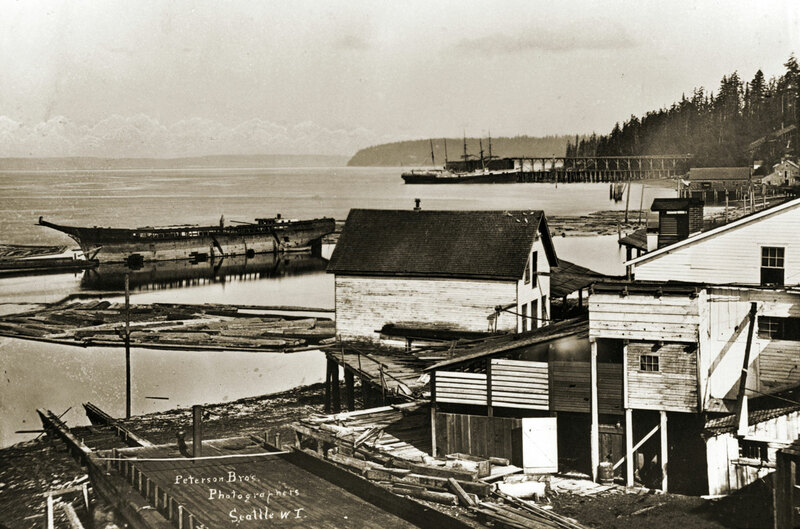 Right to left are the Wellington Coal Dock, the Schwabacher Dock, the Pike Street Pier, the two smaller "fish docks" and part of the Gaffney Dock. Also showing it the Pike Street Trestle which "carried" pedestrians safely from the water side of Railroad Avenue back and forth to the public market. 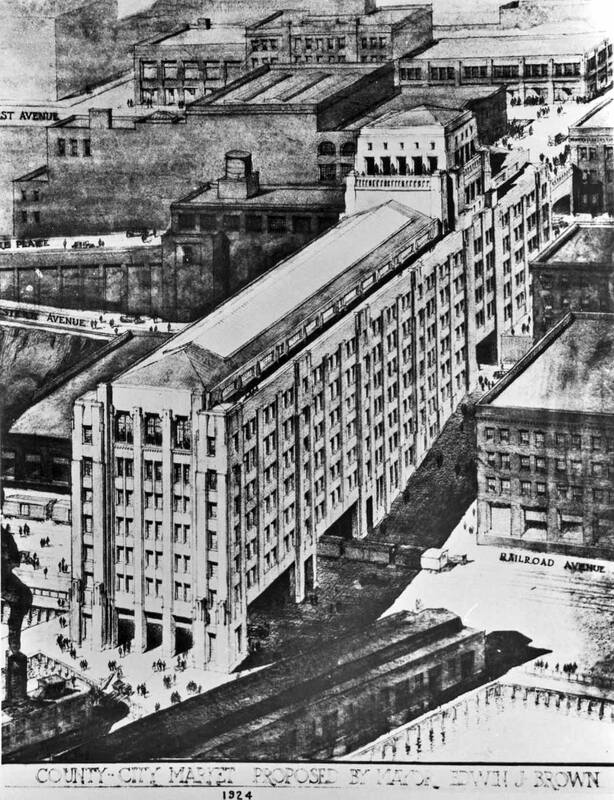 Mayor/Dentist Brown's mid-1920s proposal to built a grand pier and on shore an attached commercial structure - and early threat to Pike Street Public Market - failed. Another of the W.P.A. Tax-Inventory photos from ca. 1937. Here the Pike Street trestle has not been rebuilt to cross Railroad Avenue after it was dismantled for the 1934-36 construction of the seawall between Madison and Bay streets. A circa 1934 aerial of the waterfront that shows Railroad Avenue still with its "centerline" of a dangerous drop-off to the beach. This was filled in and covered with the 1934-36 seawall construction. The Pike Street Trestle is here still intact. The Pike Street Pier from . . . when? 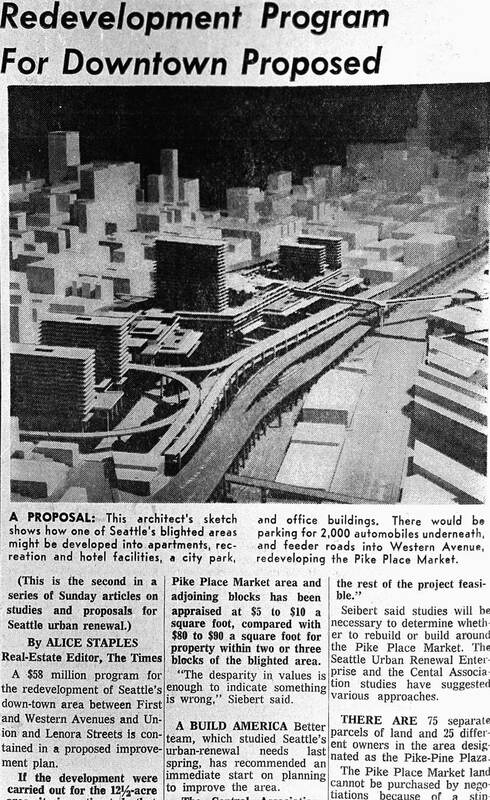 Another threat to the Pike Place Public Market - the urban renewal proposals of the early-mid 1960s. The Market neighborhood in 1967-8. 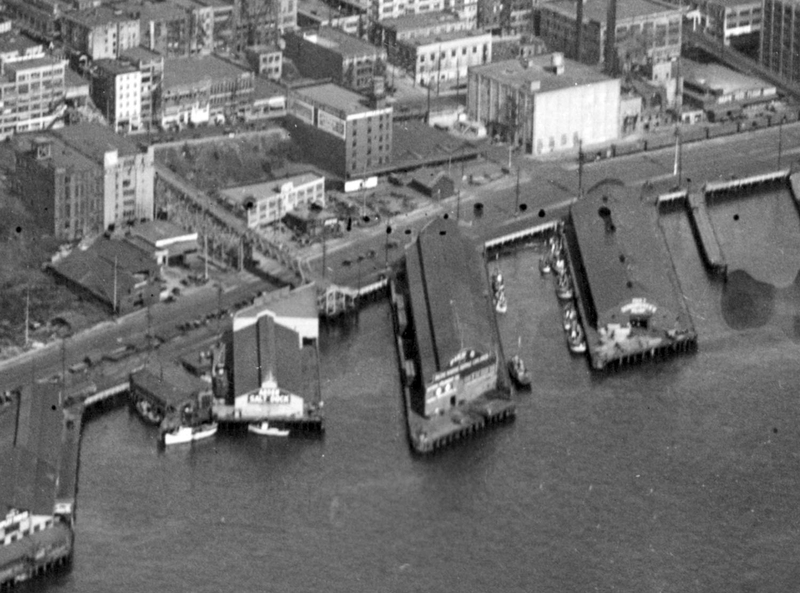 The Pike Street Pier is lower-right. Finally - this week - a quiz or contest, and still in the neighborhood. The subject dates from ca.1978, and if you were not there this will be tough. 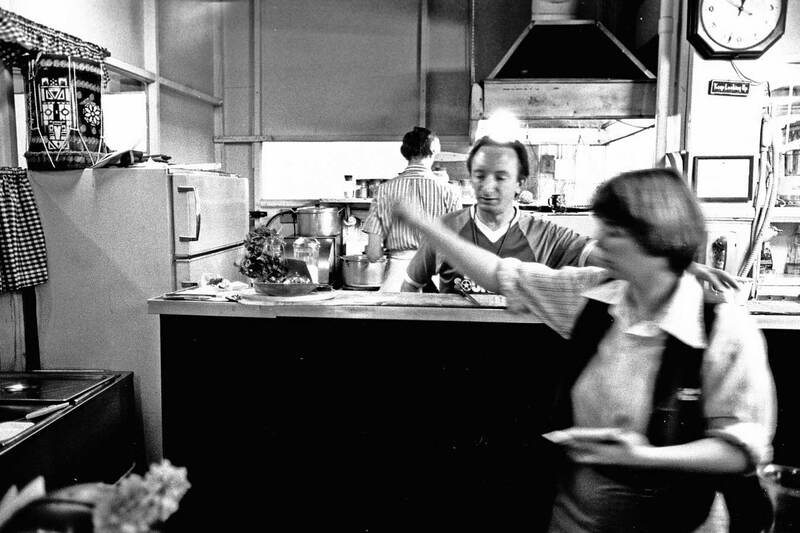 Who is the man behind the counter, and what public market restaurant is this? Hints - note the decorations. The man behind the counter - dish washing - opened his namesake gallery in the mid-60s. It was shot-lived but very influential on the local arts scene (With such a helpful hint it feels like I have almost given up the answer.) Our puzzling subject left it to spend a year reflecting on the shadows cast by cloudless skies and moving across the walls of his rented studio in Kabul Afghanistan. Our subject was it seemed, at least, beloved by all who knew him. It was an attack by strangers later on the Seattle Center grounds that weakened him so that it lead to his death. Previous PostOur Daily Sykes # 456 – Like a Honore Daumier GroupingNext PostOur Daily Sykes #457 – "Floral Aristocrat"